While Beijing’s motivation for the exchange ban is unclear, it comes amid a broad clampdown on financial risk in the run-up to a key Communist Party leadership reshuffle next month. Bitcoin has jumped about 600 percent in dollar terms over the past year, fueling concerns of a bubble. The People’s Bank of China has done trial runs of its own prototype cryptocurrency, taking it a step closer to being the first major central bank to issue digital money. OKCoin, BTC China and Huobi, the country’s three biggest bitcoin exchanges, said on Monday that they hadn’t received any regulatory notices concerning bans on cryptocurrency trading. All three venues reported transactions on Monday, with bitcoin rising 7.6 percent on OKCoin as of 5:09 p.m. local time. The exchange ban is unlikely to have a major impact on the prices of cryptocurrencies globally because venues outside China will continue trading, according to FBG Capital’s Zhou. 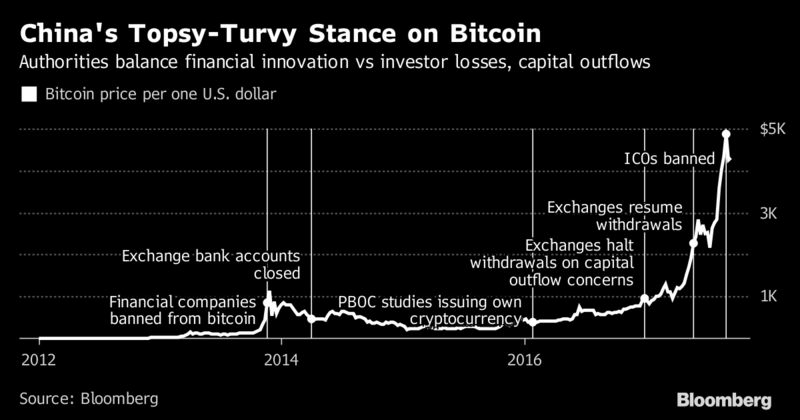 The country’s role in the bitcoin market had already started shrinking in recent months as authorities tightened regulation. At one point, exchanges in China accounted for more than 90 percent of the world’s bitcoin transactions. The bigger risk for global traders may be the massive rally in bitcoin prices, according to McFarland.